On Friday, June 16, Amazon announced it was acquiring Whole Foods Market for $13.7 billion, the largest acquisition in the online retailer's history. Just a few hours later, Walmart announced the completion of its $310 million acquisition of the men's apparel direct-to-consumer retailer Bonobos. Whole Foods' prime real estate allows Amazon to finally get into last-mile delivery, something the online retailer has historically struggled to do. Whole Foods has a 456-store footprint in the US, Canada, and the UK, mostly in upmarket, urban areas. 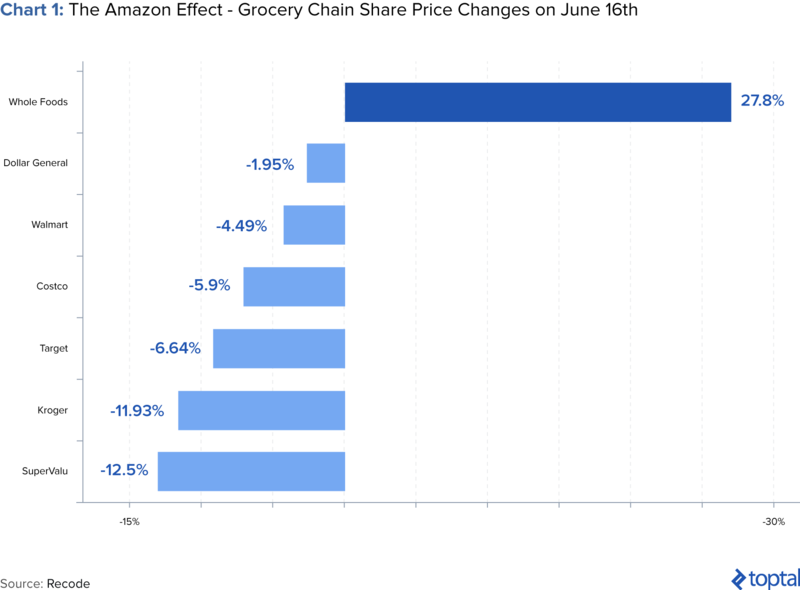 The significant implications of the Amazon/Whole Foods deal for the grocery and retail spaces explain why many retailers' stocks took a big hit after the news (down 5-10%). Walmart is pushing a strategy to buy vertically integrated companies because of higher gross profit margins. Whole Foods has some private label, but it accounts for only around 15% of revenues. 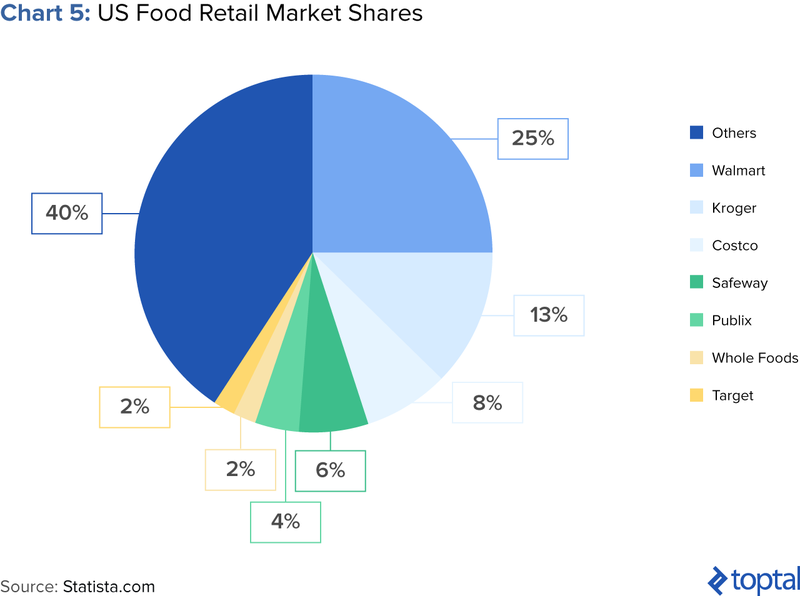 Groceries is an important category - a recent report by the Food Marketing Institute (FMI) found that US grocery sales could grow five-fold over the course of the next decade, with spending estimated at more than $100 billion by 2025. 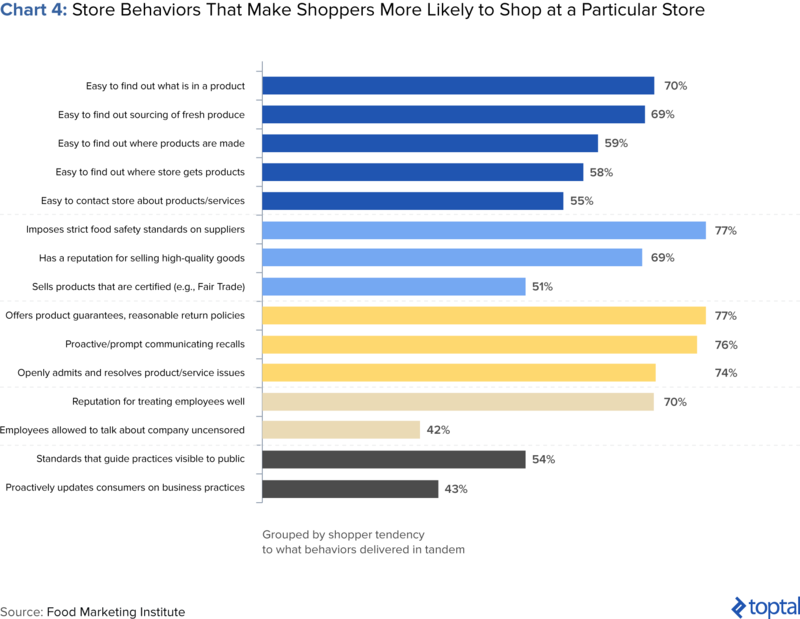 The FMI survey highlighted how 69% of shoppers valued the store's reputation when choosing which store to buy groceries at, making Whole Foods' brand an important asset for Amazon to leverage. Walmart is the nation's largest seller of groceries, selling over $170 billion last year, and the category is a key driver of store traffic and customer loyalty. Walmart has invested and tested in click-and-collect programs, stand-alone grocery pick-up sites, and even testing of an automated kiosk for 24-hour pick-up. Many voice concerns that not only do Walmart and Bonobos customers not overlap, but that Walmart's acquisition may in fact push several away. In just the space of a few days, the retail world was shaken by two big acquisition announcements from the industry’s goliaths: Walmart and Amazon. The latter grabbed the lion’s share of the headlines, announcing its acquisition of Whole Foods Market last Friday for a whopping $13.7 billion, making it the largest acquisition in the company’s history (dwarfing their $1.2 billion acquisition of Zappos in 2009). 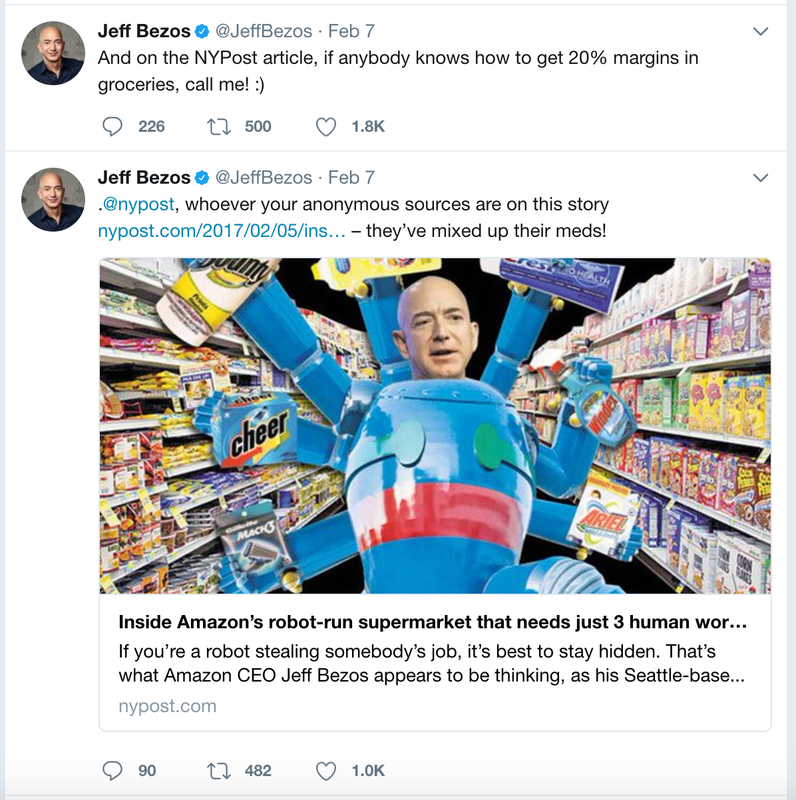 As the dust settles, it does seem clear that Amazon’s move will be far more significant, influential, and disruptive than Walmart’s. 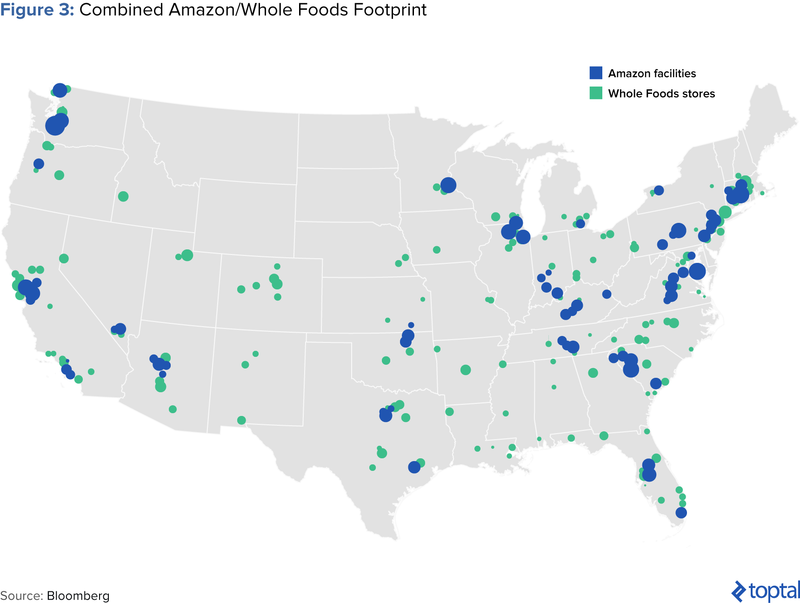 With the acquisition of Whole Foods, Amazon is possibly embarking on a radical disruption of brick & mortar retailing in the US, leaving Walmart to play defense. 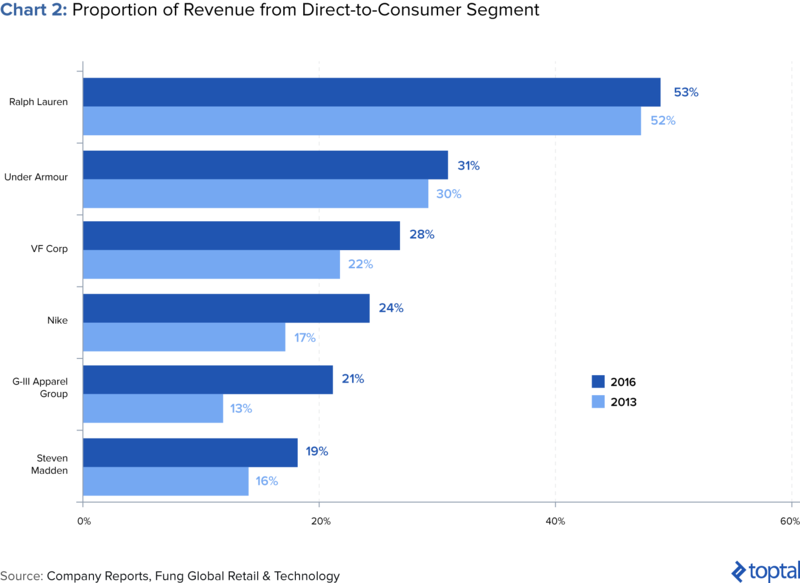 Whatever one thinks of Walmart’s strategy of diving into eCommerce via fashion, it is clear that the general trend in this space has been moving towards DTC. Established brands have been steadily increasing their share of sales from this channel as opposed to the traditional retail channels (Chart 2). 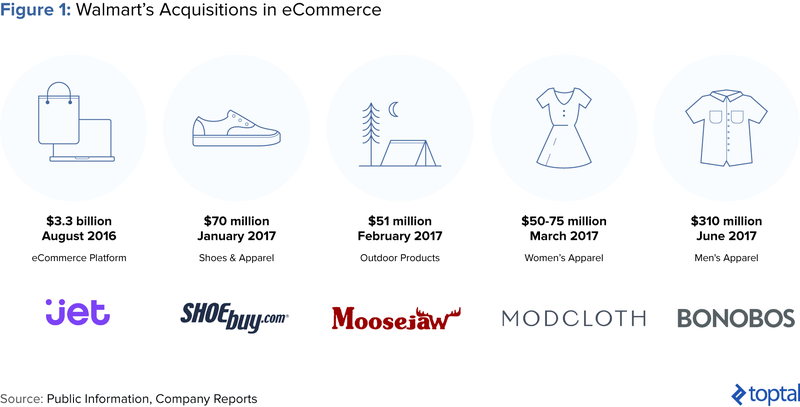 Building a strong online presence in fashion in many ways necessitates a strong positioning in DTC, something which shines through in Walmart’s recent acquisitions in the space. Amazon’s Acquisition Has a Strong Strategic Rationale—Walmart’s Less So. 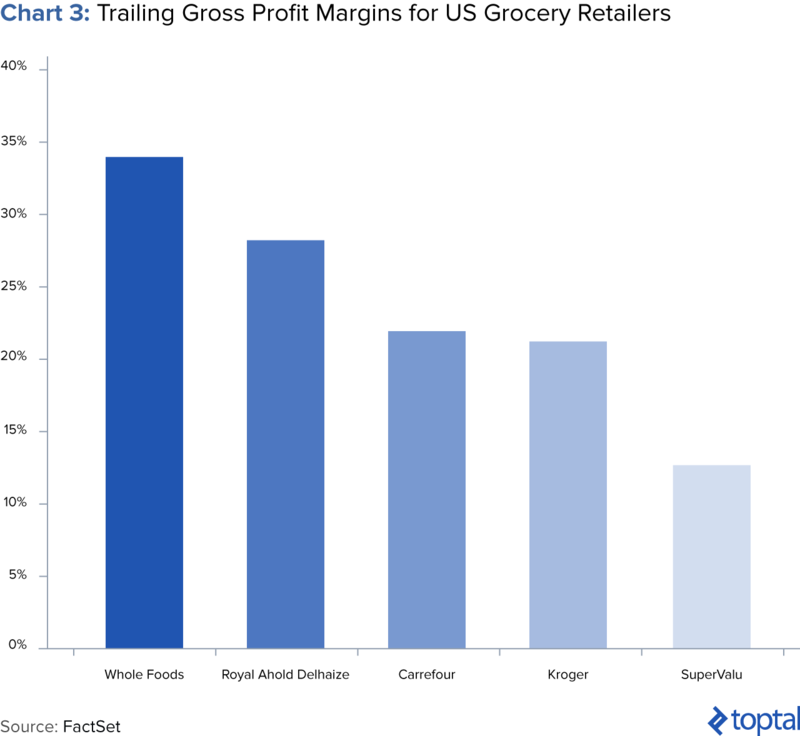 The other major benefit most Toptal Experts see is that the Whole Foods acquisition will significantly help Amazon push into a difficult niche: groceries. Groceries is an important category—a recent report by the Food Marketing Institute found that US grocery sales could grow five-fold over the course of the next decade, with spending estimated at more than $100 billion by 2025. 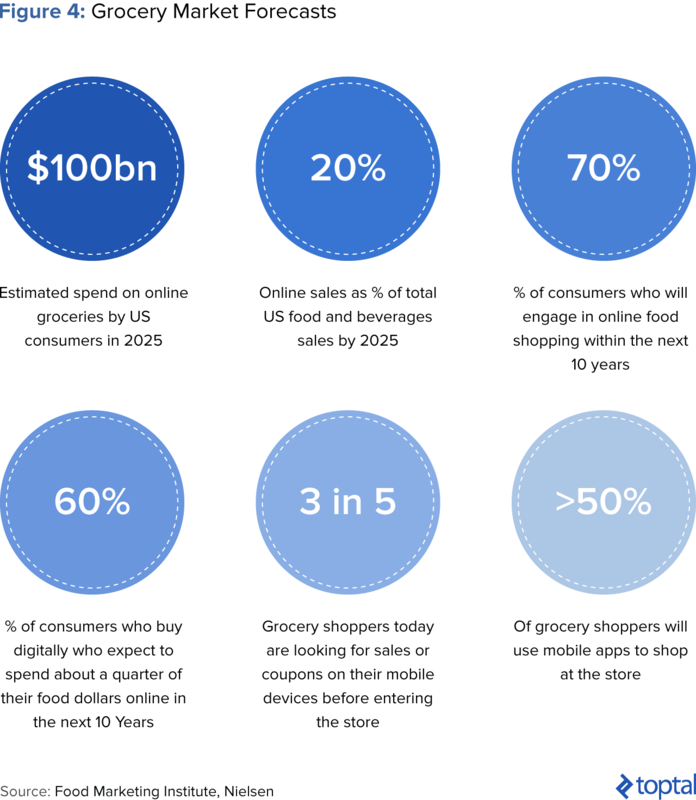 While currently, around 25% of US households shop online for groceries (up from 20% three years ago), that number will grow to more than 70% within the next ten years. And he doesn’t seem to be alone. A Business Insider article recently highlighted similar sentiment by looking at the Twitter-verse post announcement (Figure 5).